While the study of language has always been an important component of a Deerfield education, such study has become increasingly vital in today’s rapidly changing world. Deerfield offers instruction in four modern languages: Chinese, French, Arabic, and Spanish. In the modern language courses at Deerfield, oral proficiency, competency in written expression, and cultural literacy are equally important. First and second levels stress rapid acquisition of vocabulary, fundamental grammatical skills, and cultural awareness. Third-year courses provide a comprehensive review of grammatical structures and an introduction to reading and composition. Fourth-year courses are usually devoted to the development of oral proficiency and literary skills. In the fifth and sixth level courses, students delve into the literature originally written in the language they are studying. Progressive immersion in the target language is the norm in the Deerfield Academy modern language classroom. Speaking and hearing the target language allows students to explore the world through the eyes of another, embracing the diversity of voices from around the globe. As in acquiring any other skill, we acknowledge that learning a language is a challenging and rewarding process. Lifelong language learning demands engagement, flexibility, collaboration and patience. There are a number of international language programs available to Deerfield students. In most years, there are spring and summer trips abroad, organized and chaperoned by Deerfield faculty members, for students studying Chinese, French, Arabic, and Spanish. Deerfield is also an associate member of the School Year Abroad Program (SYA). Each year several Deerfield juniors and seniors live with host families and attend school in Rennes (France), Zaragoza (Spain), or Beijing (China). As one of the six official languages of the United Nations, and the 5th most spoken worldwide, the Arabic language is at heart of this global education. Deerfield Academy Arabic students graduate primed to be well-rounded global citizens and leaders. Through students’ exposure to the Arabic culture and language in class, and through a trip to Jordan, students increase their language proficiency as they begin the journey to become agents of change in an ever-shrinking world that demands cultural intelligence and global awareness. Arabic speakers are in great demand in today’s social, economic and political climate. This is evident in the many scholarships and programs that are in place already to support the advancement of learning Arabic in the US and in Europe. By choosing to study Arabic at Deerfield, students do a great service to their community and beyond. Once students learn the shapes and sounds of the 28 letters of the Alphabet they are on their way to read and write anything in Arabic. 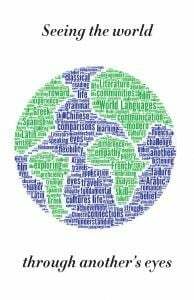 Like Hebrew and Aramaic, Arabic is a Semitic language that requires speakers of romance languages like English or French to step outside of their Indo-European language structure and into a highly predictable, well organized Roots and Patterns system. Arabic is written from right to left and beyond that, learning Arabic at a beginner’s level might surprize the learner in its simplistic and predictable grammar and structure. In class, students learn to speak in the Levantine dialect as they simultaneously study the Modern Standard Arabic, MSA, through the readings and the written assignments as it is omnipresent in the Arabic speaking world. The first two year of studying Arabic, students develop communicative skills in writing, speaking and understanding of Arabic through online and in-class activities and they demonstrate their progress by collaborating on periodic project for class. These projects are stored in each student’s electronic folders online and act as a portfolio of their accomplishment in the language. Upper level classes continue to increase their proficiency as they work with authentic literature, texts, and films alongside the textbook. Students at this level have the opportunity to bring in the vocabulary relating to their own interest as we converse in students interests and current affairs in class. The Arabic language program aims to provide students of the maximum amount of exposure to the language and the culture during the limited homework and classroom time available to the boarding student. In return, students share their knowledge with the Deerfield community through the annual Arabic Night event and other activities through the Arabic Student Club. Arabic Night is a celebration of Arabic culture is shared with the entire Deerfield community. The dining hall prepares delicious Arabic foods served at the sounds of live an authentic Arabic music ensemble. Students of Arabic host this event and provide calligraphy lessons, Henna tattoos, a fashion show of traditional outfits alongside many other activities that aim to educate and share their knowledge in a fun and entertaining fashion. Arabic Student Club here on campus, students establish a small but active community of learners who support each-other by offering tutoring and by hosting speakers or organizing activities that share their Arabic with the wider Deerfield community. Students of the Chinese language honor and contribute to a 5,000-year-old traditional that has undergone continuous development throughout the millennia. China’s rich history, vibrant culture, and enduring literary and philosophic traditions both inform and enhance the Chinese language learning experience, opening doors to an entire culture to explore. Now more than ever, the utility of the Chinese language in our globalized world has skyrocketed. With China being the largest trading partner with the United States, knowledge of the Chinese language in an invaluable tool for anyone pursuing a carrier in politics, economics, or business. At first glance, Chinese appears to be an intimidating language to approach, especially to students who come from western language backgrounds. To the untrained eye, Chinese texts appear to be a sea of unrecognizable strokes, dashes, and marks. However, students soon uncover the beauty of the Chinese written language and how its pictorial characters reflect stories that have ties to Chinese culture, history, and folklore. With each sentence, the writer creates meaning by elegantly linking characters that carry innate meaning. Non-Chinese speakers would be surprised to learn that Chinese grammar is quite simple. Unlike most Romance languages, Chinese has no verb conjugation and no noun declension, therefore there is no need to memorize verb tenses or different between gender and number distinctions. In just two years of Chinese language education at Deerfield Academy, students will have covered a vast majority of the languages’ grammar structures. What sets Chinese apart from most languages is its tonal aspect. Chinese utilizes five tone inflections that can give the same word multiple different meanings. This aspect gives a subtle complexity to the language. The Deerfield language department offers students the opportunity to embrace all that the Chinese language has to offer. Deerfield offers courses that are tailored for all types of students, from beginners who wish to develop a solid, comprehensive foundation of the language, to tutorial students who aim to converse and explore Chinese literature in its original language. Small classes of nine to twelve student creates an intimate, concentrated environment that generates free flowing learning between teacher and student as well as organic conversation among students. In the first few levels of Chinese, students grapple with new sounds and master the skills of character writing. After grasping the fundamentals, students have the skills to express themselves freely through the Chinese language. All levels of Chinese, even beginning, push students to not only learn the language, but to explore aspects of Chinese culture, history, and current events. School year aboard programs give students the opportunity to utilize the skills they develop in the classroom in a real and immediate way. Mastery of the Chinese language is crucial for maintaining the current, and developing the future global dialogue with China, offering a wealth of opportunity for students motivated enough to grasp it. Deerfield Academy’s Chinese program equips students with the skills to be leaders in the field of Chinese language and the tools to face the challenges of an increasingly globalized world. We work from the premise that all well educated individuals are able to communicate in at least one other language. Studying French at Deerfield goes beyond sitting in a classroom and memorizing grammar forms or lists of vocabulary. These do occur organically in the course of our years of study but surrounded and emboldened by conversation, debate, and discussion. Students come to us at all different levels and we expect them to embrace their study of French for their entire four years at this institution. The language study may start at the beginning in French I, where students learn the basics of the language bolstered by elements of the culture that allow them to negotiate the ins and outs of Paris arrondissements, to go to a café and order a meal in a culturally appropriate manner, and most importantly, to begin to feel as though they have a foothold in this fundamentally important language. We live in a global world – French is as relevant today as it has ever been. The language of diplomacy, romance, and adventure, French retains its air of “je ne sais quoi”. One of the advantages of a school like Deerfield is that we have students arriving with diverse cultural backgrounds and at various stages of their language learning experience. 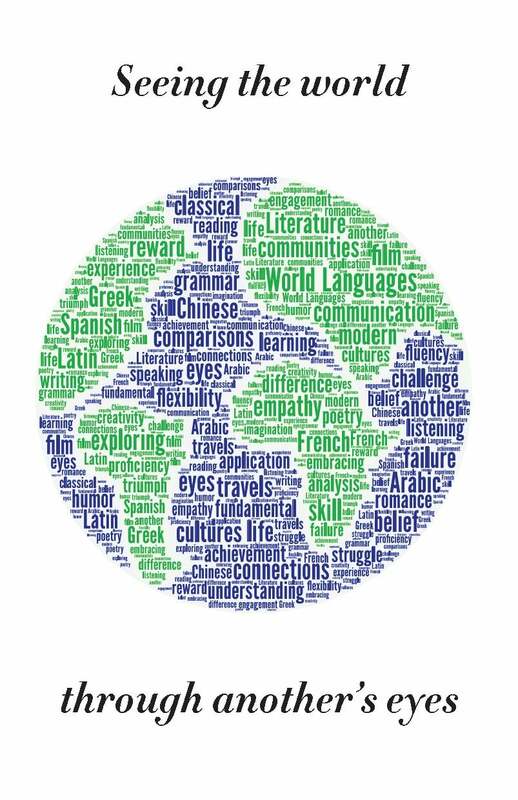 A first year French experience at Deerfield may well be at the third level of language in which they will begin to explore real-world issues such as challenges to the environment, the role of technology in today’s world, and how the media functions in francophone cultures. This type of engagement allows students to feel the burgeoning power of their French abilities, and it is often at the end of this level where students naturally gravitate to our home-stay experience abroad. Once students have lived with a French family for a month, they have solidified their commitment to the language and their true enjoyment of experiencing another culture. As they continue their exploration in the upper levels of French, our students are exposed to the wide swathe of French history through the reading of some classics and engaging with visual history through monumental events on the big screen. They are then able to grasp how modern French cultural mores were formed. The nexus of historical perspective coupled with superior language skills provides our students of French with a skeleton key to the francophone world at large. The reality is that there are over 40 countries in which the government has declared French either a national, or an official language. Our French scholars can step easily into that world and continue to hone their already impressive language skills. Studying Latin in high school presents students with valuable learning opportunities that reach across disciplines and across the span of time. By learning this ancient language students explore the essence of language itself as well as the essence of humanity that has articulated its thoughts and feelings in writing for nearly three thousand years. In the first two years of Latin at Deerfield, we focus on building the internal logic of Latin forms and vocabulary. We spend most of our class time together in English as we discuss the ways to make meaning from Latin sentences. Students learn how form relates to function while building a base of words that will serve them well as they start to read authentic texts at the end of the second year. The process of reading Latin allows students to practice multi-step problem solving and develop critical skills that serve them well in a variety of disciplines. Memorization and mastery of forms and vocabulary is important, but the application of logic to problem solving is paramount as students learn how to navigate Latin. In the first two years of the program, students benefit from a concrete understanding of grammar and syntax as well as a heightened awareness of words themselves. Over 90% of English words that have more than two syllables come from Latin, and the beginning Latin student learns how to see Latin roots and how to derive meaning in English based on their knowledge of Latin vocabulary and forms. Latin classes offer linguistic training, and this training serves students exceptionally well when it comes to communicating both verbally and in writing in English. In the third year, we transition to reading authentic Latin literature, and the Latin classroom begins to resemble an English and History seminar. We explore the nuances of meaning and the connotations of words as we unearth multiple levels of meaning in the texts we read. By understanding these works in context, we can explore their relevance not only in their own time but also in our time. The ideas, thoughts, feelings, and perspectives the ancient Romans shared in writing resonate with our own experiences in the world. These writings have shaped the course of the western intellectual tradition, and their ongoing relevance is a testament to the fact that they contain essential reflections on what it means to be human. We also begin to focus on rhetoric and ways in which authors embellish meaning in their writing. Advanced Latin students create arguments for the meaning of a passage based on the words the author chooses and on the rhetorical devices they employ. As humans, we are always trying to persuade each other using language, and ancients considered rhetoric both a science and an art. By learning the tools of rhetoric that ancient authors employed, we learn how to deconstruct arguments and marshal textual evidence in support of a thesis about meaning. These deep explorations in the literature we read teach us the power of words and the interconnectedness of human thought across the centuries. By the time a student reaches the highest levels of our program, they are a skilled and efficient reader of Latin literature. They are starting to develop a sense of how genre and literary tradition in the ancient world create even more complex allusions and metaphors familiar to the most educated ancient readers. They generate original analysis of the texts we read and can formulate cogent arguments based in the Latin text to support their conclusions. The study of Latin flourishes as an interdisciplinary undertaking at these highest levels in the curriculum, and students draw on a variety of sources as they continue to search for the essential meaning in some of the most influential literature in the history of the world. ¡Bienvenidos al español en Deerfield Academy! As a student of Spanish, you will see that there is mucho más to learn about Spanish and Latin American language and culture. You may observe your teachers drinking “mate” out of gourds, and you will learn about this traditional drink in Argentine culture. You may see your teachers performing some flamenco dance moves as you learn about Spanish art forms. The sound of “rancheros” may welcome you into a class as you learn about traditional Mexican music. Regardless of the Spanish classroom into which you enter, you can be assured that you will be deeply immersed in language and culture. Throughout your career of Spanish language acquisition at Deerfield, you will be inspired by the wealth of knowledge of your passionate teachers who yearn to transmit their love for Spanish-speaking places and people to you. In the classroom, through conversation, presentations, reading and writing, you will enjoy challenging yourself and pushing the limits of your language and imagination. Each day you will grow more comfortable and fluent in Spanish and you will gain confidence in your ability to interact in a second language – the second most widely spoken language – in this global society. Learn about the Pinyin System, in Mrs. Kelly’s Chinese class. Browse the complete course catalog for full descriptions of classes offered. Search by subject, term, grade, or AP listings. For details on faculty, department office hours, and more, see the Language Department directory page.